“Just keep your arms by your side and don’t do anything to try to help me,” said the thin, petite circus performer in a pronounced Russian accent as she was explaining what would be happening during that evening’s performance. She and her husband were going to do a magic act with me to begin the second half of the program. Feeling the laser beam intensity of her steely blue eyes, I instantly understood that they had done this trick many times before, and they didn’t need any help on my part to do it. I was to just stand there. Just stand there and do nothing. I was conducting the Louisiana Philharmonic Orchestra in a program entitled Cirque de la Symphonie. A touring group of circus performers have developed an impressive act which utilizes symphonic music while they perform in front of the orchestra. 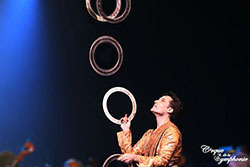 The acts feature jugglers, contortionists, aerialists, feats of eye-popping balance and strength, and a bit of magic. The music is chosen to roughly mirror the stylistic and emotional qualities of the acts themselves. So there is some latitude in the pieces chosen as long as the length corresponds to the duration of their routines. The coordination between the orchestra and the performers is not as exacting or precise as in ballet though once the performers get a sense of the tempo of the pieces, they utilize the qualities of the pieces as if the music had been specifically for their acts. These programs are extremely popular with audiences. The performance I conducted was close to sold-out—an occurrence quite normal the producer confided to me. Orchestra managements love these shows as they bring in non-traditional audiences with the tantalizing promise that perhaps a certain percentage will come back for a regular concert. Or better yet, become a subscriber. The music chosen to accompany the acts is lifted from the lighter classical repertoire. No Mahler or Boulez at these concerts. But wonderful repertoire that one can hear streaming on the so-called Pops channel all day long on SirusXM radio. The orchestra and I started the evening off with the Dvorak Carneval Overture, which was enthusiastically received. But my primary focus during the performance was trying to remember where certain sections of the orchestra had been placed. These programs tend to have little rehearsal: a quick run-through with the performers the afternoon of the event is it. But, it’s familiar music for the orchestra so the repertoire is no problem. To make room for the performers downstage, the orchestra was jammed upstage in the Mahalia Jackson Hall for the Performing Arts, putting the violists far off to my right and the horns somewhere out in left-field. Elena, the quick-change artist, acrobat, and contortionist, whom I would see again up close and personal at the beginning of the second half of the program. By the time I was into the second number, the Abreu Tico Tico with Vladimir and Elena, the quick change artists, I had located all the sections of the newly configured orchestra. However, remembering where the viola section was situated was a challenge for most of the evening. There’s probably a stale viola joke somewhere in there. Performed to the Sibelius Finlandia. A perfect choice of music for their unbelievable feats of strength and balance. The first half of the program moved along briskly with an interesting, if not mesmerizing, cavalcade of acts performed to the music of Bizet, Khachaturian, and Saint-Saens. The middle point of the first act was just the orchestra and I performing the wonderfully evocative Espana. It gave the performers a quick breather, the orchestra another moment in the spotlight, and the audience an opportunity to enjoy the brilliance of Chabrier’s masterpiece. During the intermission that followed, my mind focused only on the magic act in which I was to be a participant. I looked for the quick change artists, Elena and Vladimir, backstage but couldn’t find them. Was I really supposed to leave the orchestra playing by themselves for 5 minutes or so while I went downstage with them to do this magic act?